On August 17, 2016 reports of an airstrike targeted Al-Qaterji district in Aleppo city began appearing online. 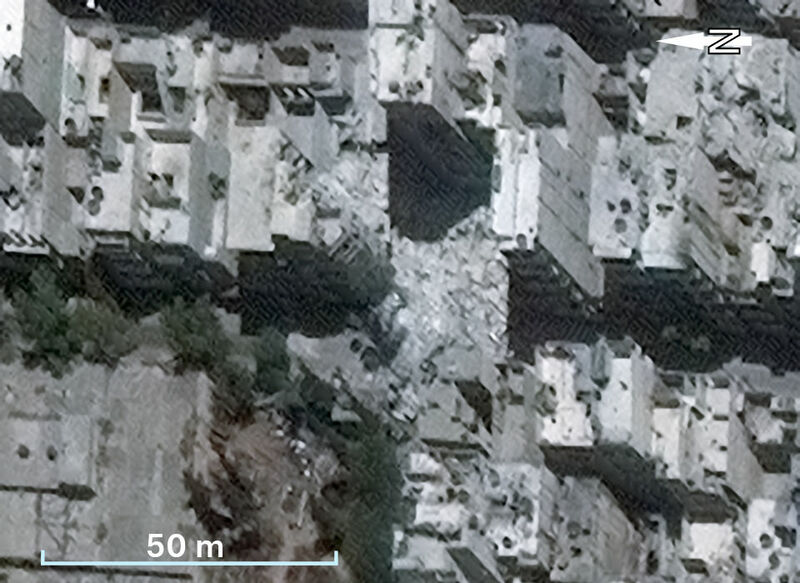 This included reports from local news agency and video footage showing the damaged area, such as the below video that was taken by Aleppo Media Center moments after the attack. It shows two people who say that they heard aircraft before the attack. Another video from Orient YouTube channel showing a rescuer from the white helmets team also stating that the area was hit by an airstrike. He mentioned 6 casualties and many injured as a result of it. The reports also included a photo of little boy called Omran Daqneesh who was rescued as a result of an alleged airstrike on the building where he used to live with his family. The photo and video brought a lot of attention to the incident, resulting in coverage by international news agencies such as Reuters, New York Times, Telegraph, and Spiegel, as well as broad coverage on social media platforms. Casualties were also reported. Omran’s brother was one of them. The following video shows an interview with a surgeon who was describing the situation of Omran’s brother when he arrived to his field hospital. On August 19th, 2016 the Russian Defence Ministry issued a statement following reports about alleged Russian airstrike that hit a civilian building in Al-Qaterji district in Aleppo. In this article we will go through the claims of the Russian ministry of defense and compare it with open source materials (photos, videos, reports) that we have collected and verified to understand better what really happened in the evening on August 17, 2016. The Russian Defence Ministry claimed that Al-Qaterji district is located directly next to two corridors opened recently through humanitarian operation coordinated by Russia. Earlier this month in August 1st, Deputy Chief of the General Staff of the Russian Armed Forces Lieutenant-General Sergei Rudskoi made a statement about opening safe corridors in Aleppo. He said that seven humanitarian corridors are active for the rescue and aid of civilians. In the Russian Defence Ministry article summarising the press conference it mentions that in addition to the seven humanitarian corridors helicopters of the Syrian Air Forces drop about 100000 leaflets on quarters of the eastern part of Aleppo every day showing the locations of humanitarian corridors and conditions for withdrawal. The below leaflet was dropped in Aleppo, showing a map with only four corridors. The image has been published by a Facebook group called Syrian_reporters, which is pro-Syrian government. The four humanitarian corridors shown in the leaflet above are far away from Al Qatarji district. There has been no reports from the ground about two corridors which are open recently and are close to Al-Qatarji district as the Russian Defence Ministry claimed in their Facebook page statement. Al Shaikh Saed mosque passage – Al Hader neighborhood. Comparing the map from the Russian Defence Ministry with the map on the leaflets dropped on Aleppo it is noticeable that the location of some of the corridors are different in both maps. We also notice that the map on the leaflet doesn’t show any corridors close to Al-Qaterji district as the Defence Ministry claimed. 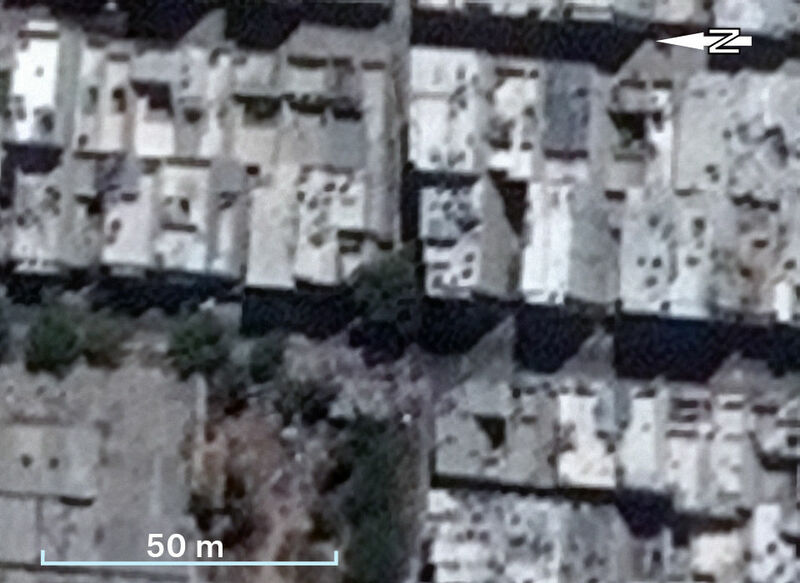 Using videos and photographs of the reported attack site it was possible to confirm the location inside Al-Qaterji district. This video was posted on the Qasioun News Agency Youtube channel showing the damaged area after the attack. Another video was posted on Al-hadath YouTube channel which shows one of the rescuers who helped the child Omran after the attack. We can also geolocate the buildings featured in this video to the same locations as the other videos. This confirms Omran was rescued from the location shown in the daytime videos. While the range and power of the Hell Cannon and its variants are generally inconsistent due to the nature of their construction, it seems extremely unlikely one could bring down two multistorey buildings separated by several meters, as seen in the above attack site. If we focus on the specific claim by the Russian Defence Ministry about “the unaffected windows in the next building” we can see from the above images that not only were the windows of adjacent buildings missing, but two separate buildings were completely destroyed by the attack. Having reviewed various broadcasts from “Western TV-channels” about the attack it is unclear which footage the Russian Defence Ministry could be referring to, but it is clear from imagery confirmed from the actual attack site that their claim is not supported by evidence. The Russian Defence Ministry claimed in their statement that the attack “was not an air bomb, but a mine or a gaz [sic] cylinder widely used by terrorists in this region”. Looking at the clashes near the attacked location (Al-Qaterji) district we notice that it’s on the contrary side of where the attack happened in Al-Qaterji district. The maps below created by Qasioun News Agency shows this. Another map from a different source, @miladvisor, shows that clashes are mainly in the south of Aleppo in Ramouseh which is far from the attacked site [Al Qaterji district]. Based on open source information it is possible to identify the exact location Omran Daqneesh was rescued, and the buildings destroyed in the attack. It is clear that the Russian Defence Ministry’s statement bears little relation to facts on the ground, as verified using open source information. As with previous Russian Defence Ministry denials related to its bombing campaign in Syria (including denials it bombed a mosque, hospital, and used cluster and incendiary bombs), these denials can be at best described as misleading, and at worst totally false. All I can say is: THANK YOU. You confirm the facts of our friends both in Aleppo and the Idleb region. Both ASSad and Putin are war criminals as are their pilot murderers. Abu Mohammed al-Adnani, Daesh propaganda “minister” has been killed in air strike. USA claims, they did. Russia claims, they did. Daesh confirms his dead. USA tells, they did it in town of al-Bab with a precision strike. Russia says they killed hin together with 40 other daesh in town of Maarat Umm al-Hausch with a SU-34 bomber on August 30th. Daesh confirms he has been killed in provice Aleppo. bith al-Bab and Maarat Umm al-Hausch are thre, but 25 km away from each other. Other IS source “Telegram” confirms al-Bab. Witness confirms drones over al-Bab. Russia again telling lies? This excuse fits into them palying the victim of NATO , USA aggression myth … And takes the heat of the facts that Russia . 1. Putin needs to deflect his people from domestic facts of economic problems of his gangster style corrupted control inside Russia..
2. Russian is stealing the vast iron and coal resources in east Ukraine..
Ukraine has Europe’s 3rd largest shale gas reserves at 42 trillion cubic …Russia’s silent shale gas victory in Ukraine The vast shale gas reserves in the separatist-held Ukrainian regions of Donetsk and Lugansk regions are an important element not to be overlooked when analysing the Ukraine crisis, writes Szilvia Batkov. world’s eyes have been on Ukraine as Ukrainians rebelled against rising authoritarianism in their own country and were met in return with a Russian invasion of Ukraine’s southern and eastern provinces. Yale University’s Timothy Snyder is the world’s leading historian of Eastern Europe. His series of articles in the New York Review of Books has been hailed as the definitive analysis of this crisis. Join him as he clarifies the stakes. Russia has the entire Siberia filled with oil, coal and gas. But of course it needs Ukraine for more of these, and this explains everything!! Especially the shale oil which is difficult and expensive to extract. Only America with high technological equipment and some risk to the environment can only recently extract shale oil and gas comparably cheep, but still considerably more expensive than Russia, Saudi and other largest oil exporters. The great explanation of Russian-Ukrainian-European-US crisis! As for that Yale professor, his lecture is very interesting, but in some places he is not completely objective nor honest. Really, who am I to object to Yale professor, but it is obvious in some places if you know anything about Russia and Ukraine. That is a kind of reinterpretation, even though he is definitely very qualified in the Eastern European history. And I especially love your assumption that Putin wants to distract attention from the economical problems. Exactly that’s why incurred the sanctions and (possibly related) oil prices drop, so that the national currency has fallen in 2 times from 30 to 65 rub/usd so everybody immediately became 2 times poorer and forgot about economical problems. The other question is that the external pressure and unfair treatment of Russia from the abroad has led to a kind of consolidation of the society and gave significant support for Putin which he had not had before. But that is probably not something that Putin has done. May be you can ask ‘the west’ why did they strengthen his position so much by all that id1ocy and populistic irresponsible steps? Oh yeah, please write more, I really enjoy your ideas. What? No trolls here yet. St. Petersbourgh must be asleep. Look at the two pretty species above – troll are already here. Or trolls in your definition are only those who object against pouring dirt to Russia? I wanted to remind other examples: the famous ‘novorossia madonna’ from the time of the very beginning of the war in Donbas, another little Syrian boy beheaded by US backed so called moderate rebels. Google if you dare. There are the same children living in Damascus, in ISIS occupied cities, in Donbas as well. I mean it is usually immoral to pick up one emotional example to exploit for propagandistic purposes and close the eyes on all the others. If there is any other way to stop the war in Syria it should be used. Syria is incomparably worse, but as for Donbas the people should also start to negotiate somehow, instead of the constant escalation and demonization of Russia. Well, how about if the Russians pull back all their arms and troops and open the borders. The major difference we can see here is Russia is a country and small armed groups are nowhere near as organized so the horrible actions of a few can be seen as just that. Bombing known hospitals, etc. is a bit different. Russia demonizes it self and then lies to try and cover it all up. But ‘Novorossia Madonna’ above is the crime of Ukrainian army. There are hundreds other crimes identified by Amnesty International commited by Ukrainian volunteer battalions. Why don’t you apply the same logic to Ukraine? Bellingcat basically chooses which crimes should be focused on in order to promote some political agenda, and which should be kept in silence. That is how modern propaganda works. Poland’s shale gas reserves proved to be commercially useless and it seems Ukraine’s have also. Wells have been drilled in Ukraine but now it’s been abandoned.